For several years, Heike Hilkenbach and her husband had a holiday home in Loppersum, Eastern Friesland in Germany. It was very close to the sea. "I loved this part of Germany with this clear 'wideness' where you can see the sky without looking up." 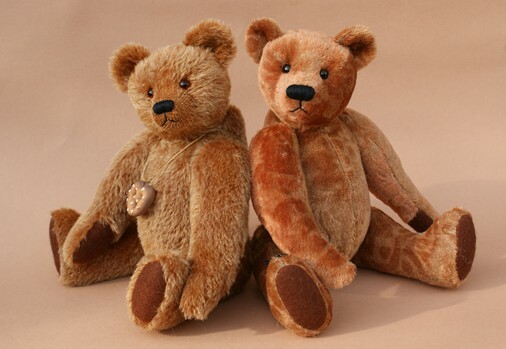 It was during a holiday that Heike decided to incorporate her feelings into her bears and named her company, "Loppi Bären (bears). "The Loppi bears have the 'wideness' in their heart." Heike grew up with hobbies that included knitting, crocheting and sewing. But one day, she just wanted to try something new and teddy bears came just in time. 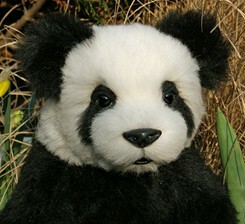 I bought a teddy bear making kit which contained good materials." 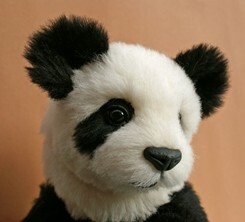 The results were far better and by participating in workshops, conducted by popular bear makers, she succeeded and improved. 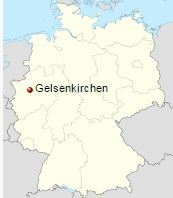 Heike and her husband currently live in Gelsenkirchen, North Rhine-Westphalia, Germany with a mountain dog named, "Henry." During long walks with her dog, her mind conceives new ideas. Her first bears were contemporary with big noses and big paw pads. She continued to experiment with various fabrics, played with different patterns and proportions along with sewing techniques. She worked with open mouth designs, sculpted and Trapunto techniques and modeled clay noses. "I tried different styles over and over again," and during the last year she has specialized in the old fashion looking bears and sweet natural bears. She is currently designing small bears just 9 cm (3.50") tall. 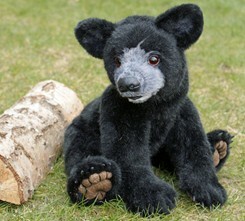 More and more of Heikes' time is spent, not only learning new bear making techniques but sharing that knowledge with others; giving workshops for up-and-coming bear makers. She is participating in a bear club, located in her town, that meets to sew, drink tea and have fun. Heike has won several competitions, but works mainly on building her business. 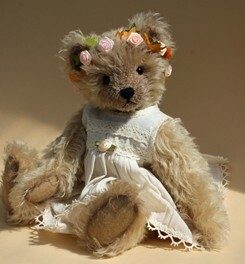 "I have met a lot of lovely collectors and other bear artists over the years. I often have the feeling that the bears choose exactly the right person for them; some by collecting, others by teddy bear making." And with the "wideness" of heart that her bears bring out in others, it's no wonder that she's so happy with bear making. I would like to share these feelings with all the other people who are drawn to teddy bears." "After all," Heike says, "a life with bears is a happy life."